Yesterday at 4 and 4:30 pm just as I was entering Canada by air, my two dairy goats gave birth. I had checked them Wednesday morning before I left for my flight and there wasn’t a great deal of difference from the night before. Nina had maybe a couple more drips of discharge and felt even softer in the tailhead/ligament area. Piper seemed right behind her in that department but had no discharge. I could still feel the kids on their right sides and so I thought it would not be for another 12 hours at the least. After my two flights and 3 hour drive to my parents house in the great, sorta-white, north of Alberta, I spoke to my husband on the phone. He let me know he had some rough news. Piper gave birth first. My son found her after school with baby goat hooves just beginning to show out her rear. He helped deliver the kid and went and called my husband at work. The baby wasn’t moving much and didn’t seem to have much fight. My husband did his best to resuscitate it but it did not survive. As he was working on it, Nina began to give birth to her kid. One leg was bent back so Daniel assisted the delivery by pulling as Nina pushed. All came out well and Nina is an excellent mother. Piper has never been milked before and my husband said she was really calm and he was able to almost completely empty her. I’m not even sure how he did it as we have not quite gotten everything set up yet for milking. The roof is on the goat shed but the walls are not closed in and we haven’t set up the milking stand yet. How does that bible verse go? Men make plans but the Lord decides? I have been coaching myself and consciously deciding to dwell on the positive. All kinds of things go through my head that are fruitless. I think it is a complete waste of time to do the “what if’s”. Even though I think this way, these thoughts still float through my head. 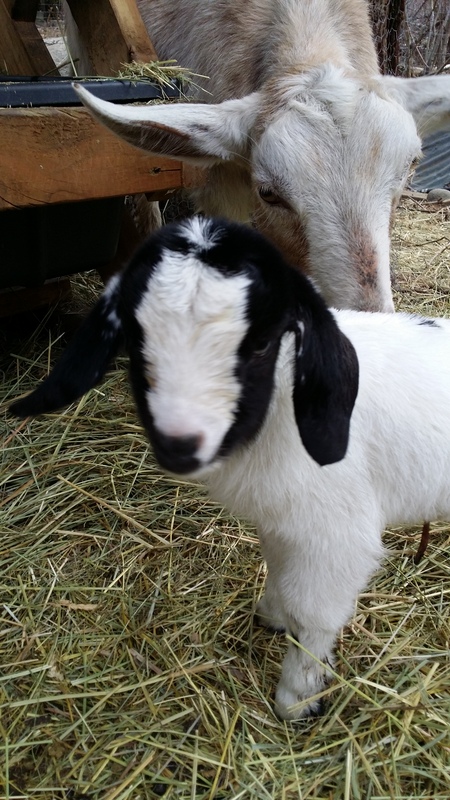 Now, here are some cute baby goat pictures! So sorry for your loss, but congrats on the living one. I had a doe go into labor this morning, but the boy was breech and wouldn’t come out even with assistance until this evening. It turns out that this doe had triplets like last year, 2 bucks and 1 doeling. I know how it feels to have something go wrong with a kidding, but the joy of having new kids is worth the occasional casualty. Thank you. Congratulations on your kids too.